My older daughter calls Valentine’s Day, “Chocolate Day,” because that’s mostly how we celebrate the day–with chocolate. Yesterday, I was looking for a easy, gluten-free chocolate treat that I could make as a quick after-school snack. 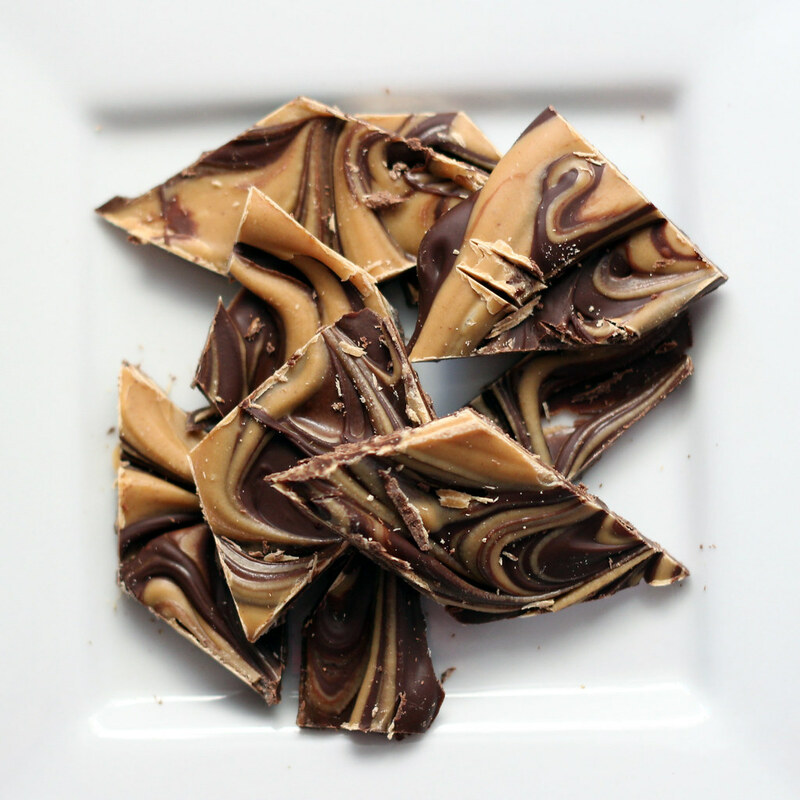 In a matter of minutes, I whipped up this Chocolate Peanut Butter Bark. I’ve made Dark and White Chocolate Pomegranate Bark before (actually, it was the first recipe on this blog) and ever-popular Peppermint Bark (similar thing, but with crushed candy canes instead of pomegranate seeds). So this recipe is a twist on those favorites. You’ve got to love a recipe that has only two ingredients, comes together in minutes (other than the refrigeration time and clean-up time), looks fancy, tastes great and is naturally gluten-free. Note: When you are melting chocolate, make sure the bowl and utensils are dry, without any drops of water. If water mixes with chocolate, the chocolate will seize and become a gunky mess when heated. Also, when using the microwave, heat the chocolate on half-power (not full-power) and remove the chocolate when it is mostly (but not all the way) melted, to prevent overheating. When you stir the chocolate, the residual heat will melt the rest of the chocolate (and if not, pop it back in the microwave briefly at half power). What are some of your favorite chocolate treats? Place chocolate chips in a large bowl and microwave on half power (such as 5 out of 10) for 1-1/2 minutes, or until mostly melted. Stir chocolate well to melt the remaining chocolate chips (if not melting, pop bowl back in the microwave briefly). Pour chocolate onto prepared baking sheet and spread thinly with a rubber spatula into a rough rectangle. Place peanut butter chips in a large bowl and microwave on half power (such as 5 out of 10) for 1-1/2 minutes, or until mostly melted. Stir well to melt the remaining peanut butter chips (if not melting, pop bowl back in the microwave briefly). Pour dollops of melted peanut buter chips on top of the chocolate. Drag the tip of a knife through the peanut butter to swirl it through the chocolate. Refrigerate for at least 30 minutes, until firm. Cut into bite-sized bark with a large knife. Note that you won’t really be sawing/cutting the bark, but rather I take a large chef’s knife, put both hands on top of it and press down on the bark to break it up. 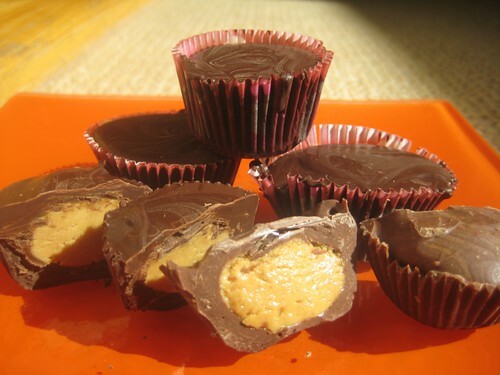 Homemade peanut butter cups -- naturally gluten-free! Recently, I made gluten-free Girl Scouts Tagalong cookies, or peanut butter pattties. We had leftover peanut butter filling, so my daughters and I decided to make homemade peanut butter cups, like miniature Reese’s peanut butter cups — naturally gluten-free and naturally delicious! My friend Chris had sent me a recipe for homemade chocolate candy cups, with a choice of either a peanut butter or peppermint filling, and I realized we could adapt her recipe using our leftovers. I had previously bought some mini baking cups (like miniature cupcake liners) at the dollar store, so we had all the ingredients on hand for this easy gluten-free chocolate candy. In a large bowl, mix peanut butter, powdered sugar and a pinch of salt until well combined. Use your hands to roll peanut butter mixture into 1/2-inch balls; roll balls quickly so your hands don’t get sticky. Set balls aside on a plate. Place chocolate chips in a large bowl. Heat in the microwave for 1 minute on half-power (such as power level 5). Stir chocolate thoroughly. If not melted, pop bowl in the microwave for subsequent 30-second intervals, stirring until chocolate is melted. Place a dollop of melted chocolate in the bottom of the mini baking cups, so the chocolate covers the bottom of the cup. Drop peanut butter balls in the middle of the mini baking cups. Spoon dollops of melted chocolate on top of the peanut butter balls. The melted chocolate should surround the sides and top of the peanut butter balls, evenly covering the peanut butter and leaving a smooth chocolate top. Stick the mini muffin tin in the refrigerator for at least 30 minutes, so the chocolate hardens. Enjoy your homemade candy! Yield: I’m sorry — I forgot to note the yield, but it probably makes around 20 to 24 mini peanut butter cups. 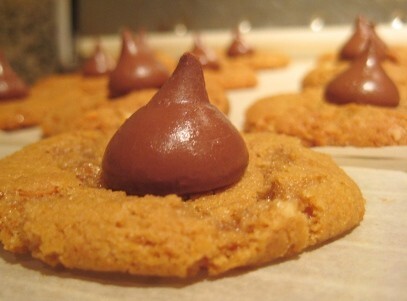 These easy-to-make gluten-free peanut butter cookies are sealed with a kiss – Hershey’s Kisses placed on the cookies while they are still warm from the oven. The bonus: The cookies are naturally gluten free, with no flour at all, making them good crowd-pleasers. Plus, the peanut butter packs a protein punch, which we’re always looking for in our house. Thank you to my friend Rebecca who provided the flourless peanut butter cookie recipe. I just added a kiss. Peanut butter jars can easily become contaminated by bread crumbs spread on a sandwich knife. We always have two jars of peanut butter and two jars of jelly in our house, marked in permanent marker: GF ONLY and NOT GF. My mother has a squeeze bottle of jelly, so crumbs don’t get in the jar. I’m a crunchy, natural peanut butter fan. True, natural peanut butter is a pain. The oil separates, so you need to plunge your knife into the jar to mix it up, inevitably resulting in an overflowing mess. Still, one look at the ingredients and you’ll be convinced to go natural. Most peanut butters contain sugar and hydrogenated vegetable oil. Even mainstream natural brands like Skippy Natural and Jiff Natural contain added sugar, palm oil and salt. By contrast, Trader Joe’s organic crunchy unsalted peanut butter has one ingredient: peanuts. And the Whole Foods 365 Everyday PB has two ingredients: peanuts and salt (though, curiously, their 365 Organic brand has added palm oil). While you’re at it, check your jam or jelly. Most contain high-fructose corn syrup. Who needs that? Buy a brand that contains simply fruit or is sweetened with other fruit juices.